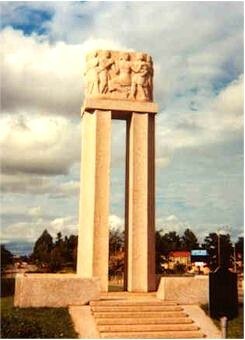 This cenotaph made of Texas pink granite, it was designed by Donald S. Nelson, architect, Herring Coe, Sculptor. It was erected in 1939. Engraved on the stones facing the cenotaph are the names of the known victims by school grade. I recently visited the London Museum. I started with a great lunch in the Museum Tea Shop followed by a guided tour from Mollie Ward, the Museum founder and curator. It's a wonderful museum that honors the victims of this tragedy, both those that perished and those left to grieve. At 3:05 PM, March 18, 1937 the new New London school building was destroyed by a natural gas explosion. The investigation indicated that a gas leak in the large and virtually un-vented basement of the school had been ignited by an unknown spark in the building. Some 298 students, teachers and visitors were killed either immediately or within a few days because of injuries. One of the main causes for the explosion and fire was that the natural gas used in the building was raw unprocessed natural gas which is virtually odorless. As a result of the accident within a few weeks the Texas Legislatures passed new regulations requiring that all utility gas must be odorized so that leaks could be more easily detected. Today natural gas and LNG (propane) are odorized with the strong odor of ethyl mercaptan. I recently went to New London with the hope of visiting the London Museum. Unfortunately I got there just as it was closing. The museum is getting a face lift. I took a picture but rather than put here I will go back later and get one when the construction is completed. I did manage to catch museum curator Mollie Ward. She was kind enough to speak to me for awhile and explain how the museum was started and how it impacted the community. Although the New London Explosion occurred in 1937 the museum was not started until the mid to late 1990's. "On March 18, 1937, a massive explosion destroyed the New London Junior Senior High School. Instantly killing an estimated 296 students and teachers. The subsequent deaths of victims from injuries sustained that day brought the final; death count to 311. The explosion was blamed on a natural gas leak beneath the school building. Within weeks of the disaster the Texas legislature passed a law requiring an odor to be added to natural gas, which previously was odorless and therefore undetectable. This memorial to the victims of the explosions was erected in 1939." For a lighter story about ethyl mercaptan go to this Gas Plant Tales page.